Mapped from DEP Wetlands data: bog. Bogs and fens are peatlands, which are wetlands characterized by a buildup of fibrous organic soils (peat). 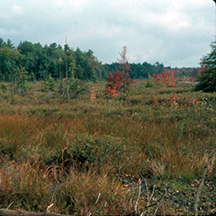 Bogs are nutrient-poor peatlands – some get just about all their nutrients from rain water – and are often characterized by ericaceous (acidic and nutrient-poor) shrubs and Sphagnum mosses. Fens generally receive nutrients from water that flows into these wetlands as either surface or groundwater?. Those that receive only a limited amount of nutrients are sometimes referred to as “poor fens” and share much of the same vegetation as bogs. Those that are characterized by abundant nutrients are called “rich fens” and often support a diversity of grasses and sedges instead of Sphagnum moss.